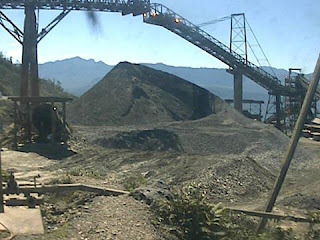 Operations at the giant Ok Tedi mine in Papua New Guinea's Western Province are being suspended today. There's no more digging and milling as of today with the long dry weather and downfall in metal prices severely impacting operations. Low levels at the Fly River is stopping the company from shipping concentrates out as well as bring in food, fuel and other essential supplies to Tabubil. Many of the estimated 2,000 employees have been retrenched while others are being temporarily stood down leaving a skeleton staff of about 180 to 200 on site to look after the mine until it resumes normal operations. The suspension is expected to last for about six to eight months. The retrenched staff have been paid their entitlements while those being stood down will be on an allowance. They have started moving out this week with additional police flown in to ensure peaceful repatriation. The international and primary schools have closed while children of employees on site who are in grades 10 and 12 at the secondary school will sit their exams before they leave. The company is holding regular briefings with all affected to ensure smooth and orderly suspension of operations.